Ladies High heeled shoes, size 8. Pink floral, very nice for any occasion. Perfect condtion, lovely floral pattern and very nice silver lining. Purple satin ankle strap sandals with jewelled strap. 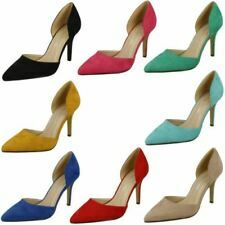 4.25" stiletto heels - approx. Anne Michelle Strappy Shoes Size 4. Condition is Used. Dispatched with Royal Mail 2nd Class. These shoes are stunning to wear. There is some slight scuffing to the front, but not really noticeable. Beautiful for evenings, partying or just to wear with jeans or trousers. Excellent quality pair of peeptoe court shoes. Comfortable to wear. Ideal now only for Fancy Dress as feathers are looking a bit rough, but they look great on. Priced low due to these defects. Excellent quality pair of Dimante T bar strappy shoes. Ideal weddings/proms/cruises/parties etc. Adjustable buckle at side of heel strap. T Bar and 4" Stiletto heels. Ladies Glitter Shoes With Diamante Deco size 6 uk, 39 eu. ( Anne Michelle ). Condition is Used. Dispatched with Royal Mail 2nd Class. In nice condition, used maybe twice, very pretty for that special occasion, heel is 4". Gorgeous stiletto sandals in a snakeskin pattern in brown and ceam Size 4 / 37. Condition is used but still have plenty of wear left in them. From a smoke and pet free home. Dispatched with Royal Mail 2nd Class. White Satin with Diamonte Trim. With Diamonte Trim. 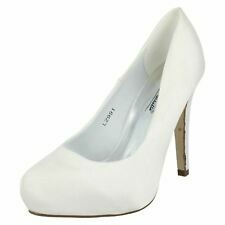 Kitten Heel Wedding / Court Shoes. Heel Type: Kitten Heel. EUR Size 40. Wedding / Court Shoe. The shoes are also guarded with shape protector rods. BNIB. ANNE MICHELLE. SIZE 4/37. BLACK SLINGBACK, PLATFORM PEEP TOE HEELS. STUNNING BLACK FABRIC PARTY SHOES WITH FEATHER AND DIAMANTÉ DETAIL LOTS OF PHOTOS TO SHOW ALL ASPECTS OF ITEM. MULTIPLE PURCHASES AND COLLECTION WELCOME. PLEASE NOTE BEFORE BIDDING. ITEM MUST BE PAID FOR WITHIN A WEEK OR WILL BE RELISTED IF ITEM IS USED PLEASE BE AWARE THERE MAYBE MINOR FLAWS AND SIGNS OF USE. Size 7 black patent high back, stiletto heel sandals from Anne Michelle. Size 4 purp[le and green peep toe, stiletto heel shoes from Anne Michelle.